NAF today said it has bombarded Boko Haram enclaves in Sambisa with air strikes from five aircrafts resulting in heavy causalities since the commencement of Operation Ruwan Wuta II. 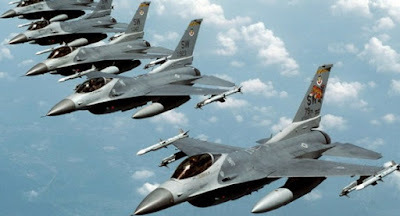 The Nigerian Air Force said within three days of the rain of fire on the insurgents in the Northeast, their structures have been destroyed, while survivors who were fleeing the target areas were neutralized with rockets and cannons. The Director of Public Relations and Information of the NAF, Air Commodore Olatokunbo Adesanya said in a statement that the air interdictions were meant to clear remnants of the insurgents from their various hideouts in the Northeast. The statement reads: “In continuation of Operation RUWAN WUTA II, the Nigerian Air Force (NAF) has continued to rain significant fire on Boko Haram Terrorists (BHTs) locations, with intensive day and night aerial bombardments. “On 24 Oct 17, the second day of the Operation, the NAF conducted an air interdiction mission on the BHT-infested settlement of GHATA MUSA, located about 16km Northwest of MADAGALI. “The location was observed to have significant BHT activities, indicative of its use as a hideout for the insurgents. The air interdiction was conducted by 5 aircraft namely 2 F-7Ni aircraft, armed with bombs and 3 Alpha Jet aircraft, armed with a combination of bombs, rockets and cannons. “Two Alpha Jet aircraft and 2 F-Ni aircraft took turns to pound the location with bombs, destroying some structures and sending a few BHT survivors fleeing from the location. “Thereafter, the third Alpha Jet Aircraft returned to strafe the location with rockets and cannons, neutralizing some fleeing insurgents in the process. “On Day 3 of the Operation, the NAF conducted another air interdiction mission on a BHT structure in PARISU, which is the Northeastern gateway into the Sambisa Forest. “The target building in PARISU was confirmed to be a BHT hideout and subsequently earmarked for attack. Four NAF aircraft namely 2 x F-7Ni aircraft, armed with bombs and 2 x Alpha Jet aircraft, armed with bombs and rockets, conducted the air interdiction. “One Alpha Jet aircraft and the 2 x F-7Ni aircraft took turns to attack the location with bombs, thereby destroying the target structure. “This was followed up with rockets and cannons’ attack of the target area, by the second Alpha Jet aircraft, after which no terrorist movement was further observed at the location.